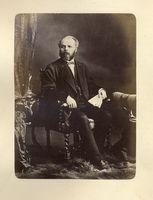 MORIN, LOUIS-SIMÉON, lawyer and politician; b. 20 Jan. 1831 at Lavaltrie, Lower Canada, of the marriage of Joseph Morin, a farmer, and Félicité Peltier, niece of Salomon Juneau*, the founder of Milwaukee, Wisconsin; d. a bachelor on 7 May 1879 at Lavaltrie, Que. 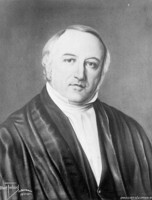 From 1841 to 1849 Louis-Siméon Morin pursued his classical studies at the college of L’Assomption, then trained for the profession of lawyer in the office of Côme-Séraphin Cherrier* and Antoine-Aimé Dorion*. He was called to the bar of Lower Canada in 1853, and went into partnership at Montreal with Gédéon Ouimet* and Louis-Wilfrid Marchand*. While still young, he shone in the court-room by his eloquence and skill, especially in criminal cases. 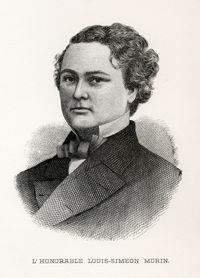 He contributed to La Patrie, a journal published in Montreal from 1854 to 1858 which gave moderate support to the Liberal-Conservative coalition. 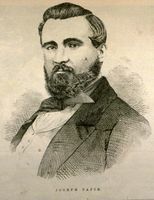 In the general election of 1854, Louis-Siméon Morin waged a brilliant but unsuccessful struggle in the constituency of L’Assomption against Joseph Papin*, the distinguished Rouge party candidate; he was returned unopposed as mla for Terrebonne in the general election of 1857, and in 1860 entered the cabinet of John A. Macdonald* and George-Étienne Cartier as attorney general for Canada East. 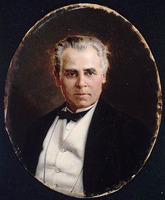 During the by-election which at that time was necessary after an mla entered a cabinet, the government’s opponents, represented by Godefroy Laviolette*, put up a stiff fight against Morin; he emerged victorious, but was defeated in the 1861 election in the constituency of Terrebonne by Louis Labrèche-Viger. He then stood in Laval, where he won out over Joseph-Hyacinthe Bellerose*. 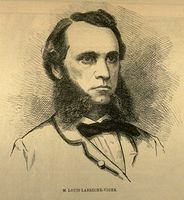 In 1863 Morin was again defeated in Terrebonne by Louis Labrèche-Viger. 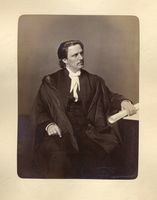 In 1865 the government appointed him French secretary of the commission for the codification of the laws of Lower Canada relating to civil matters, replacing Joseph-Ubalde Beaudry, who had been raised to the position of commissioner following the death of Judge Augustin-Norbert Morin*. 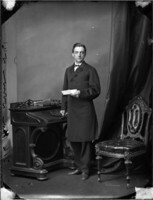 Morin held this office until the commission completed its task in 1867, on the eve of confederation [see René-Édouard Caron]. Afterwards he lived at Lavaltrie, out of public life. 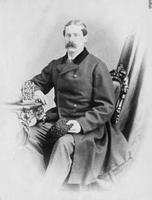 On 27 July 1871 the Quebec government appointed him joint protonotary, with Joseph-Octave Désilets, of the Superior Court, and clerk of the crown for the district of Joliette. He died on 7 May 1879 at Lavaltrie. La Minerve (Montréal), 13 mai 1879. La Patrie (Montréal), 1854–58. Beaulieu et Hamelin, Journaux du Québec, 135. Dom. ann. reg., 1879, 415–16. L.-O, David, Souvenirs et biographies, 1870–1910 (Montréal, 1911), 49–54. Anastase Forget, Histoire du collège de L’Assomption (Montréal, ), 541. 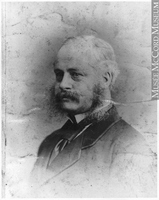 J.-C. Bonenfant, “MORIN, LOUIS-SIMÉON,” in Dictionary of Canadian Biography, vol. 10, University of Toronto/Université Laval, 2003–, accessed April 22, 2019, http://www.biographi.ca/en/bio/morin_louis_simeon_10E.html.